The UAE drug maker Julphar increased the value of its assets last year as the government pushes for more home-grown manufacturing of medicine. 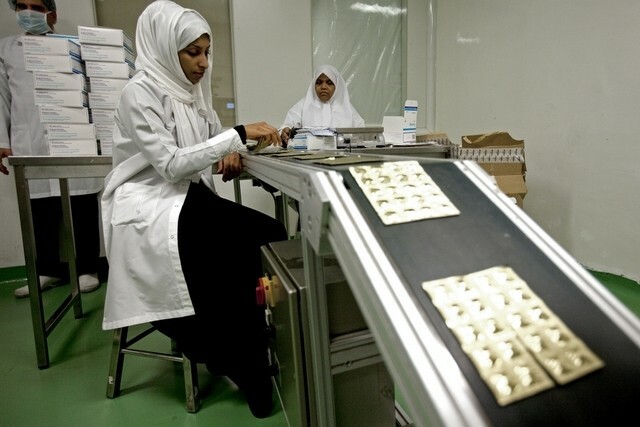 The manufacturer of generic medicines now has assets worth Dh3.25 billion, compared with Dh3.05bn at the end of 2013, the company disclosed on the Abu Dhabi Securities Exchange yesterday. It reported sales of Dh1.43bn last year, up by 5.3 per cent year-on-year. Net profit reached Dh2.34 million, up by 2.9 per cent, compared to Dh228m in 2013. The company could not be reached for additional comment. Its shares were unchanged yesterday at Dh3.20. Last year, Julphar said it would invest in property, plant and equipment additions and spent Dh27.5m on these during the first half. Its total investment was Dh95.5m during the period. This month, Julphar completed the acquisition of the Bangladesh-based RAK Pharmaceuticals from RAK Ceramics for US$9.5m. The deal comes with a factory outside the capital Dhaka that manufactures about 100 products. RAK Pharmaceuticals had more than $5.7m in sales in 2013. Julphar also has 11 factories in the UAE and one in Ethiopia. It is building a facility in Jeddah with Cigalah Group. The UAE had the second largest pharmaceuticals market in the Arabian Gulf in 2012, valued at $1.6bn, up by 3 per cent on 2011, according to an Alpen Capital report in 2013. The market is driven primarily by branded medicines, with generic medicine consumption at only about 20 per cent. As this tends to push up medicine prices, the federal government has sought to cut prices of medicines in phases since 2011. The Ministry of Health this month set lower prices for 280 medicines, including those for diabetes, blood pressure, high cholesterol, neurological, viral diseases and cancer. The drugs include conventional and herbal medicine as well as biological food supplements. In the UAE, other local generic drug makers include Neopharma and Medpharma. About 90 international pharmaceutical companies have a presence in the UAE.